• In January 2013, Accurate changed their hardware for metal partitions. 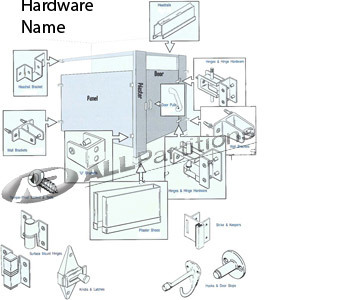 Click here to go to new hardware for Accurate metal partitions. Old style top hinge for Accurate brand metal partitions manufactured before 2013. 1-1/2" between screws. Wraps around an 1-1/4" thick round edge pilaster. Bright/polished chrome. Old style bottom hinge for Accurate brand metal partitions manufactured before 2013. 1-1/2" between screws. Wraps around an 1-1/4" thick round edge pilaster. Bright/polished chrome. Old style top hinge pin for Accurate brand metal partitions manufactured before 2013. Old style bottom hinge top cam for Accurate brand metal partitions manufactured before 2013. Old style bottom hinge bottom cam for Accurate brand metal toilet partitions manufactured before 2013. Old style bottom hinge bolt for Accurate brand metal partitions manufactured before 2013. Old style door insert closure cap for Accurate brand metal partitions manufactured before 2013. Old style standard latch knob and cover set for Accurate brand metal partitions manufactured before 2013. Old style ADA latch knob and cover set for Accurate brand metal partitions manufactured before 2013. Old style latch slide pin for Accurate brand metal partitions manufactured before 2013. Old style keeper bumper for Accurate brand metal partitions manufactured before 2013. 1-1/2" between screws. Wraps around an 1-1/4" thick pilaster. 3-3/8" projection, 2-3/4" high. Used on Accurate brand metal partitions manufactured before 2013. Old style top hinge for Accurate brand metal partitions manufactured before 2013. 1-1/2" between screws. Wraps around an 1-1/4" thick round edge pilaster. Brushed/satin finish. Old style bottom hinge for Accurate brand metal partitions manufactured before 2013. 1-1/2" between screws. Wraps around an 1-1/4" thick round edge pilaster. Brushed/satin finish. Old style standard latch knob and cover set for Accurate brand metal partitions manufactured before 2013. Brushed/satin finish. Includes the knob (HACL3SS) and the cover (HACL6NSS). Sold as set only. Old style ADA latch knob and cover set for Accurate brand metal partitions manufactured before 2013. Brushed/satin finish. Includes the ADA latch knob (HACL3ASS) and the cover (HACL6NSS). For 1" thick doors; 2 1/4" wide; 2 3/16" high; 3/8" diameter top hole; 3/4" diameter bottom hole. For 1-1/4" thick pilasters. Bright chrome. Includes mounting screws. Brushed or bright finish. 1-1/2" wide x 3-1/4" long. 2-3/4" hole spacing. The HAP68N used to be used on Accurate solid plastic partitions and is currently used on Accurate solid phenolic partitions. The HAP68BC is currently used on Accurate plastic laminate partitions. Also used by Global Partitions. Door pull for solid polymer plastic or solid phenolic Accurate Partitions. 2-3/4" between hole centers. Brushed/satin finish. 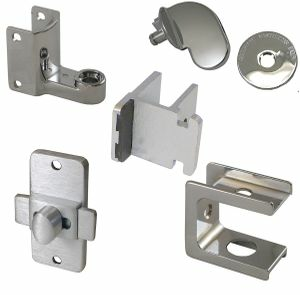 Latch for new solid plastic partitions manufactured by Accurate. Brushed aluminum. 2-3/4" between hole centers. New outswing keeper bumper for solid plastic partitions manufactured by Accurate. Brushed aluminum. For 1" thick pilasters. New inswing keeper bumper for solid plastic partitions manufactured by Accurate. Brushed aluminum. For 1" thick pilasters.